Chip Reid is Capitol Hill correspondent for CBS News. 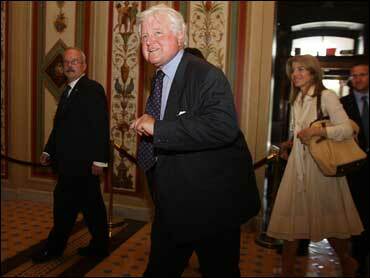 Sen. Ted Kennedy, accompanied by Barack Obama, walked onto the Senate floor today to a thunderous standing ovation from Democrats and Republicans alike. Kennedy, who is undergoing chemotherapy for a brain tumor, returned to Washington to vote in favor of a Medicare bill, that would avert a rate cut for doctors. Kennedy's wife, Victoria, wiped away tears as she watched from the Senate gallery. She was joined by Caroline Kennedy, daughter of Sen. Kennedy's brother, President John F. Kennedy. At one point a beaming Sen. Kennedy looked up and waved to his wife from the Senate floor. When he voted, he shouted "aye!" with both thumbs up. Kennedy's son, Rep. Patrick Kennedy, joined the bipartisan mob of Senators who surrounded Kennedy, patting him on the back and taking turns shaking his hand, welcoming him back to the Senate.